Gentle Tasaday - "In the Mind's Eye of a Blind Tasaday"
Vortex Navigation Company - "Things Make Patterns as they Fall"
Here are three more items from the Minneapolis SpaceRock Family (Salamander, Skye Klad, et al. ), which you can read more about in the Live Review section. Both of Salamander's guitarists have been working on side projects lately, and Erik Wivinus' other band Skye Klad is also working on new material. Let's start with Gentle Tasaday, the duo of Erik and Eric; the latter being Eric Hofferber who adds vocals, cornet, flute, electronics, and percussion to the gamut of instruments that Erik W. plays. First the name... I admit I initially read it as 'Gentle Tuesday.' Doh! But no, I have since learned that the Tasaday are an isolated cave-dwelling tribe 'discovered' in the Philippines in 1971. Soon thereafter hailed as a Stone Age relic, now many anthropologists denounce them as fakes. Anyway, on to the music. The album starts rather oddly with the high-pitched sonic f/X of "Psychedelic Emergency" (exactly how it sounds) and then another distant echoey piece ("Stone Grape: Part One") with only a very subtle rhythm and some flute bits here and there. But then "Sad Wheel of the Season" presents a cool psychedelic/folk mix with quiet spoken word vocals and excellent lead guitar work (a little like Dave Brock's pre-HW "Illusions"). A similar style (acoustic and electric guitars working together now) takes hold in both "Summer Story" and "Vision Burn," featuring what I'm guessing is e-bow applied to Erik's Vox Cheetah guitar. The whispered readings finally become loud enough to make out in "Walking on the Coals to the Coldest Despair," a seemingly random bunch of thoughts like "With sweet music in the air, I saw another vision." Awright. "Gethsemane Aflame" is undoubtedly the most uptempo and 'poppy' piece on the album, a welcome change of pace from the dronier pieces. The finale "Of Cobwebs and Obtuse Angels" is a pretty bizarre collection of sampled 'chipmunk voices' and horror-film style noises and f/X...what a way to finish! 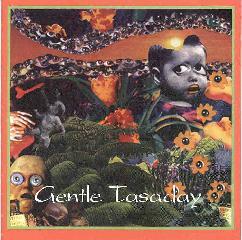 As far as the music goes, Gentle Tasaday is very much like Tombstone Valentine (see SD'99 review), or even moreso the Aether supergroup 'In the Summer of the Mushroom Honey' (see AI#7). Eric H.'s spoken-style vocals are rather appropriate here, but I must admit to favoring TV's Richelle Toombs more prominent soulful singing over similar trancelike sounds. Gentle Tasaday is a worthwhile journey nonetheless. 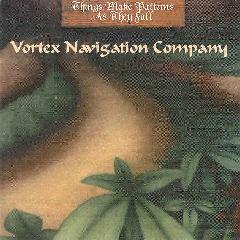 Vortex Navigation Company is the duo of Salamander's Sean Connaughty and Wes Morden (sharing duties on guitar, vocals, and loops/fX), with various guests (mainly percussion), to a large part doing spontaneous improvisations in one or the other's basement 'studios.' "Green Pyramid" is an experiment in mild droney dissonance and spooky lead guitar - not bad for a start. One of the few composed numbers, "Holler" features peculiar extra-bassy vocals over a misty potpourri of acoustic guitar, cricket chirping, and Peter Hollis' organ. It's October and Halloween is almost here... perfect timing! As you can probably tell, the whole album is moody and (presumably) introspective, and "Europa" is perhaps the best result of this approach. Subtle mallet percussion (by Wivinus no less) works beautifully behind the tapestry of warm echoey sounds... hard to distinguish the synthetic loops from the guitars sometimes. Later in the 20-minute piece, it turns slightly grey and even more soupy...a mind-numbing bliss out. Perhaps you won't even notice the Little Drummer Boy making an appearance in the background. "Down in the Willow Garden" is a traditional folk ditty that Sean probably heard drifting across a plantation one day while time-travelling from his current Georgia home-away-from-home. The other VNC original composition is "The Welcoming River," an acoustic piece but is rather unsettling in a very intriguing way - probably my favorite track on the album. On a par with Roger Waters' better dark-toned works anyway. 'Things' wraps up with another lengthy echo-drone work "Flying Low over Green Hills" that builds towards a freak-out climax and then a gradual easing off. All in all, this album is a pretty nice collection of things to lighten your spirit even as it darkens the skies overhead. Skye Klad's newest single "Mind's Eye" is an upbeat four minutes of sheer delight, almost a surf/ska rhythm but then topped with dizzying psychedelia from the dueling guitars of Wivinus and Jason Kesselring. Adam Backstrom (I assume) adds the breathy Damo-esque vocals and what you have is a fun-filled number that could probably fool lots of unsuspecting normal people into listening to psychedelic music. "Kindred Raga" is a reverberating rosin-wheel drone excursion just as the title suggests, complete with the obligatory chantlike vocalizations. This eight-minute piece would've worked nicely with either of the other two albums above. I don't know how or when these tracks will appear on vinyl/CD, but I'm happy to see that the full contingent of Twin Cities spaceheads are hard at work in the studio. For more information on Gentle Tasaday and Vortex Navigation Company you can visit the Camera Obscura web site. For more information on Skye Klad you can visit their web site.